Now, you and I both know that price does not necessarily mean quality. But when it comes to grilling, there are 2 grills that I believe make up for their cost more than adequately. And if you’re in the market for a brand new quality, forever-kind of grill, I suggest you look into these 2 excellent options: the Weber S-670 and the Weber S-660. The Weber Summit S series is the mainstay of Weber’s best gas grills. They are definitely pricier than your average grill, but you will understand why and just how much they are worth every penny. Whether you’re an avid griller or someone new to grilling, I’m sure you have come across the name, Weber. I don’t need to say much about the brand and their quality product, as you already know how high their standards are. But what I will say, is that these 2 grills are by far more than worth the money. If the cost is not an issue, then by all means read on and see for yourself the sheer awesomeness that Weber has to offer with these two killer grill options. The Weber S-670 is one of the biggest grill models and has a lot of added bonuses for its owner. With 6 stainless steel burners and a primary cooking space of 624 sq. inches, this is definitely a seriously large grill. Besides the huge cooking area, you also get an additional 145 sq. inches of warming rack to put those rare or medium-rare steaks, while you finish the ones already on the grill. The main burners can reach up to a whopping 60,000 BTUs, while the side burners can reach a stellar 12,000 BTUs. Granted, this may not be the absolute hottest grill you will find, but after about 50,000 BTUs the difference is pretty negligible. You also get to enjoy amazing bonuses like a sear station with 12,000 BTUs, a smoker burner with 6,800 BTUs, and a rear-mounted infrared rotisserie burner with 10,600 BTUs. The Weber S-670 is also known to heat up evenly with little to none flare-ups. 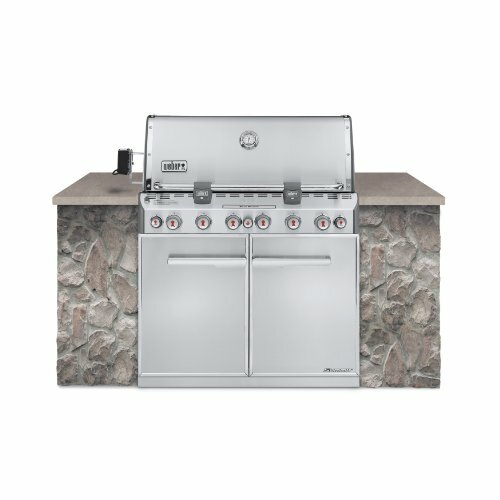 With the Weber Summit, you will definitely have more dinners on the grill, outdoor parties, family reunions, and the like. Because this is such a high-performing gas grill, it will ensure you enjoy the grilling experience without breaking a sweat, so to speak. Imagine having friends and family over for your kid’s birthday, you have burgers and steaks for the adults on one side and enough space to put on some hotdogs for the kids. You can cook food for a big crowd, with more than enough elbowroom. 1. All the reviews are like having hundreds of really good friends give you their personal experience with the grill, then taking all of that personal experience and giving it a star rating. You’re buying quality when there are 100′s of fans of the grill. 2. A friendly UPS driver will deliver it right to your door. No waiting in line, no hauling it in your car. No sore muscles or achy back the next day. 3. Amazon has the best price 99% of the time. Amazon constantly watches competitor pricing and makes sure you get the best deal. They do a ton of business and take advantage of economies of scale, which means you get the savings! 4. FREE shipping. Enough said. 5. Returns are easy. Amazon recently shipped a car, and they ship a ton of large items, all day, every day. If they can ship a car, rest assured, you will get your grill in perfect condition. BUT if for any reason it comes damaged, it is super easy to return. Just print out a UPS label, slap it on the box and a friendly UPS driver will pick it up, free of charge. This is way easier than waiting in a return line at Home Depot and talking with a bored, angsty teenage sales clerk. Another great grill from Weber is the brother of the S-670, which is the Weber Summit S-660. The S-660 is the built in version of the S-670. I suggest going down to your local store and see what this grill looks like before you actually buy it, as it is uniquely built in size and shape. This baby is one large built in grill with 624 sq. inches of primary cooking area and a total cooking area of 769 sq. inches. 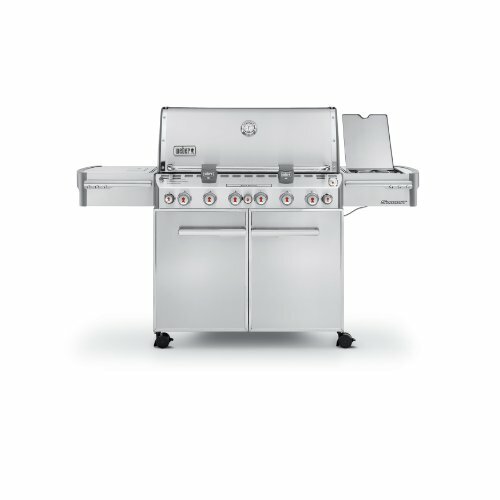 This grill, much like the S-670, also has 6 stainless steel burners with 60,000 BTUs. You also get 6,800 BTUs on a smoker burner with an added bonus of a stainless steel smoker box. The S-660 also has a sear burner and an infrared rear-mounted rotisserie burner that can both reach up to 10,600 BTUs. This is one of the best built in gas grills out there in the market and you won’t regret buying this for yourself or for your family. This is a top of the line grill from Weber, so you expect quality, durability, and value for money. As mentioned, this is a built in version of the S-670 and the only reason you’ll buy this over the S-670 is that you have the space for this one in your kitchen. You don’t get to move this around when you want to, it stays exactly where you want it to be. If you have been looking for a built in grill for your kitchen or maybe in your outdoor kitchen, this is definitely a good option for you, as it will top most of its competitors on the market. At a great price of $2,639.99 on Amazon, you can get this baby and enjoy all it has to offer. •pieces fit together easily and securely •Legends around front panel on/off knobs do not last; wash grill a few times and the legends for burner positions and fire levels are gone. Poorly designed labels do not stick to stainless metal panel. •Igniters for infrared burners do not perform well, even with fully charged new batteries. Sparks do not reach burner, needing frequent adjustments. •Gaps between metal components allow oils and grease to escape and drip from back of grill. •makes good pork tenderloin as the one we cooked on the rotisserie. •The smoker chamber is a nice feature that adds a bit of the slow smoked taste that is usually reserved for wood smokers. Best Gas Grills Under 200 Dollars | The Ultimate Buyers Guide! Best Gas Grills Under 500 Dollars | The Ultimate Buyers Guide! Weber Summit series is the beast. Best in the business if you have the money to buy it.